Sony says it will free you from expensive cable contracts through its ambitious PlayStation Vue live-TV streaming service, which will initially work on the PlayStation gaming console but later spread to devices like Apple's iPad. PS Vue TV will be available starting on Wednesday to users of the PlayStation 3 and 4 gaming consoles, but will also be offered on other Internet-connected TVs and devices, said Daniel Myers [CQ], head of product for PlayStation Vue at Sony Network Entertainment. "We'll be going to non-Sony platforms," Myers said. Sony specified that Vue would be available for the iPad, but did not offer a timeframe, and did not specify the other devices that the service will run on. The service will first be available in Chicago, Philadelphia and New York, which are big TV markets and have a huge PlayStation installed base. The service will spread to other markets in the U.S. later this year. There are approximately 35 million PS3 and PS4 users in the U.S., Myers said. Pricing for the service starts at US$49.99 for core channels -- including local channels -- from content providers like CBS, NBC, Fox, Scripps, Viacom, Discovery and Turner Broadcasting. Content from AMC will come in April. For $59.99, users can get additional channels like TCM, Golf Channel and city-specific sports channels. An elite package of $69.99 will include all channels offered by the service, including CNBC, Cooking Channel, Boomerang, BET and an additional package of MTV, Fox Sports and VH1 channels. There are no hidden fees and taxes are included, Sony says. In addition to live TV streaming, PS Vue provides on-demand access to content for 28 days from the day it was first broadcast. The content is served from Sony's cloud, and users don't have to worry about owning a DVR to record or access specific episodes. But by storing TV episodes for only 28 days, PS Vue's on-demand content library is limited. Sony is aware of that limitation, but PS Vue isn't meant to duplicate popular streaming services like Netflix or Hulu, which offer instant access to full seasons of TV shows but don't stream live TV. "We think we have a really compelling offering," Myers said. "To a certain degree, we're not trying to duplicate efforts that already exist today." If you own a PlayStation, the price could be a good reason to consider cutting cable TV. An increasing number of consumers are washing their hands of expensive cable contracts, and companies like Time Warner Cable and Comcast have come under fire for poor customer service. "We do think for current programming, [PS Vue] is a significant option," Myers said. "I don't see necessarily why you would own both." But there are some barriers that could limit the adoption of PS Vue. For one, a user needs to own a PlayStation, and the PS4 sells for a hefty $399. But Sony's target audience for now is current PlayStation owners, and the goal was to provide more entertainment options on the console, Myers said. The service is also missing key cable channels like ESPN and HBO. ESPN is also a key offering of the Internet-based Sling TV streaming service offered by Dish, which for $20 also live-streams TV channels like AMC, TNT, Disney Channel and Cartoon Network. PS Vue does, however, have the advantage of streaming local channels, which Sling doesn't. Myers didn't specifically say whether ESPN or HBO would be added, but said Sony is talking to major content providers. The service will evolve over time, with more content added based on user feedback, Myers said. 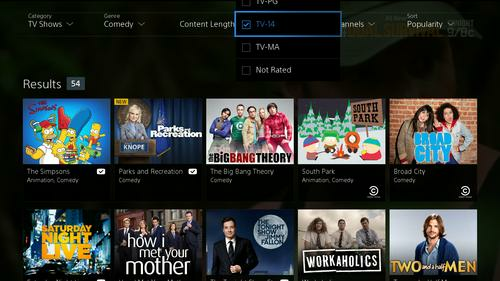 The service is a work-in-progress, but PS Vue has an innovative tile-based user interface from which it is easy to navigate and find relevant channels. A "My Shows" section provides a watch list of favorite shows. Users can favorite TV shows, which are then added to the list. A traditional search feature helps find specific shows. For those who aren't sure what to watch, it's possible to find shows based on category, ratings, subject matter, genre and channels. The search feature can filter content based on parameters selected. There's also a listing of programs in the format of traditional TV guides. A vertical grid lists the channels and TV shows playing at a specific time, and Sony has made it easy to access past episodes through the grid. The DualShock 4 wireless controller that ships by default with the PS4 acts as a remote control. The controller provides good directional navigation of the UI, but the buttons aren't labeled, which could be confusing for users new to PS Vue. Sony is working to bring some conventional TV remote controls to work with PS Vue, Myers said.